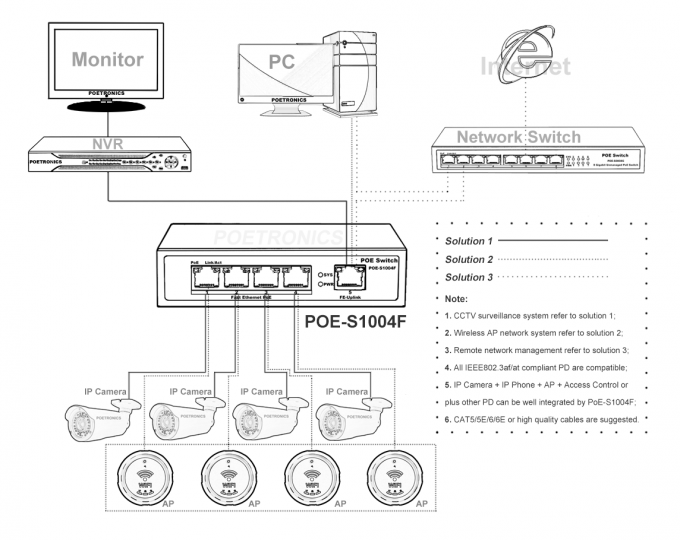 POE-S1004F is universal and most economical 4 ports Power over Ethernet Switch that we develop and manufacture, it’s popular in global distributing market of network system, meanwhile, it has strong practicality and suit for CCTV surveillance installed in household and home office and other network systems. 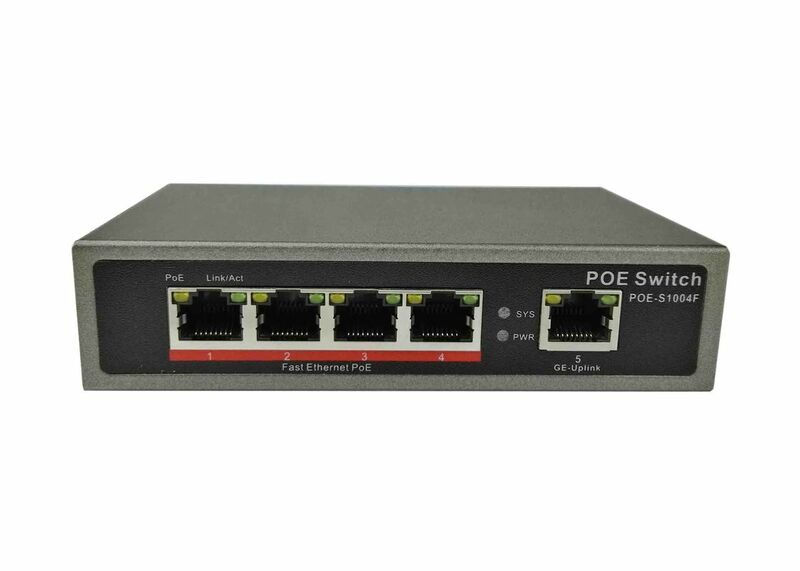 4 ports 10/100Mbps POE extensions available for any IEEE802.3af/at based equipment, it is equipped with 65W external power supply adapter, average about 16W for each PoE output channel, each output supplies max. 30W for corresponding powered device, which enables it compatible for most POE powered device (PD) that requires power lower than 30W such as wireless AP, VoIP phone, IP camera, etc. 4 port 10/100Mbps POE + 1 port 10/100Mbps Uplink. Compliance with IEEE 802.3af/at, IEEE 802.3u, IEEE 802.3ab. Auto MDI/MDIX, Store-and-forward, 1G Bandwidth. Max 30W for a single port, total 65W output. Supports wire-speed switching and jumbo frame up to 9KB transmission. Applied to IP Camera, Wireless AP, VoIP phone, Intelligent Access Control, etc. V: 1-4 PoE Ports VLAN isolating from each other, broadcast and multicast storm and ARP virus protection; Apply to wireless AP and other equipment. S: Max 250meters Super remote transmission mode, apply to long distance transmission in IP CCTV, Wireless network and other PoE systems. Fast Ethernet: half-duplex 100Mbps, full-duplex 200Mbps.